The Boutique Hotel Golden Lion Hotel is a classic, elegant and comfortable with modernity that our guests require. Our property of Hotel Boutique, the number of rooms allows us to provide family care and highly personalized, which makes our hotel the best lodging experience. We are a hotel that knows and understands the desires of our guests, so every day we strive to provide all service and comfort they deserve. Comfort is living in our spacious and comfortable queen-size beds, sofas in her delicate, attentive service in the room and its relaxing and bubbly bath tub included. All our rooms include cable TV, work desk, wireless internet and safe, making them the ideal place for tourist or business traveler. Our Suites offer an elegant atmosphere where you can enjoy a pleasant and relaxing Jacuzzi room, lit to create the perfect atmosphere you need. Internet, fax, printing and computer rental. 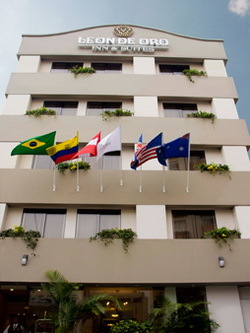 We are located on the coast of Miraflores, west side.